The impact of last Friday's earthquake and ensuing tsunami are still being felt. Those hit hardest are certainly not thinking of video games. But in an effort to be respectful, game companies are either holding back or completely canceling titles that could remind people of the recent destruction in Japan. Tokyo-based developer Irem has completely canceled action game Disaster Report 4 (pictured, via Game Watch Impress ), which had been slated for a spring release. The company has apologized to those connected to the game and those looking forward to the title. In the days following the earthquake, the game was actually rising up the Amazon Japan sales chart. 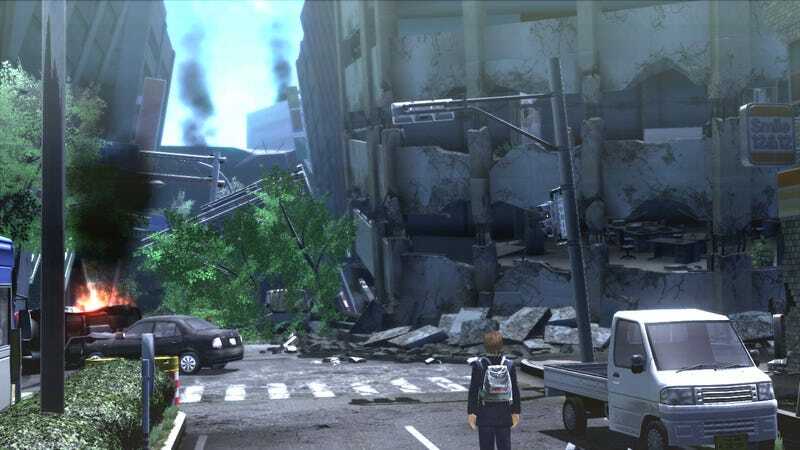 The Disaster Report games are set against the backdrop of natural disasters, and the fourth entry in the series seems to have hit too close to home. Other games, like Motorstorm 3: Apocalypse and Yakuza: of the End - both with apocalyptic-themes - were delayed. The timing couldn't be worse for both games, which show urban environments in ruins. Sony will provide a new release date for Motorstorm in the future. The game was scheduled for a March 17 release. Likewise, Yakuza: of the End, which was supposed to be out this week, will be released at a later date. Yakuza: Of The End is a zombie game, but does feature a destroyed urban center. The game industry is not alone. Japanese television is also pulling shows and cartoons that feature cities being destroyed or even tsunami. Capcom even went as far as delaying downloadable Marvel vs. Capcom 3 characters (Shuma Gorath and Jill). No word if this impacts the West. Once things return to "normal", Motorstorm and Yakuza will finally appear on store shelves and these Marvel vs. Capcom 3 characters should be downloadable.